Since this art project about peace, I decided to design my own mosque because it is already a peaceful thing, and I thought that I can add more things to show these peacefulness. Actually, my concept for this project is to have some name of God that represent peace such as, Al-Rahman, Al-Raheem, Al-Ghafour, Al-Afou, Al-Ra'ouf, Al-Salam, Al-Haq, and Allah. At the same time, I knew that peace is related to light, so I came up with the shadow’s effect. It is basically about doing windows that have the shape of God’s names and these names (shadows) appear to the mosque in a beautiful way. Since most of people when they pray and talk to God, they look upward, so for this reason, I decided to have these shadows on the top (the ceiling). Furthermore, since my whole project is about shadow which means sun, I had to think about a specific site that could give me the sun rays to where I exactly want. I had to choose a place where the sun rays at least appear through the four sides. I did my research and I found a good place where the sun rays could somehow goes through the north side too. So the site is located in the Yunb’a beach, Yunb’a, Saudi Arabia. And this site is also perfect because two stories buildings are not allowed, so nothing will affect the sun rays that I need. The name of this mosque is Al Mo'men Mosque. I chose this name since peace means Salam in Arabic, and Islam comes from the word Salam, and Muslim people are Mo'men (Belief) in God. So, it is related to peace in somehow. Moreover, Al-Moa'men is one of the God's names. Regarding the Floor Plan, I did a huge entrance works as a waiting area and seating area. And from the left and the right side I have the w.c for males and females. In addition, I made a huge outdoor praying space (courtyard) and I applied an Islamic texture on the floor, and six water feature on the same space to warm up the outdoor area. Moreover, I did a two pathways from both side and closed them with glass to make it indoor and apply electricity, instead of using the outdoor (praying) space, for people who want to go to the main (mosque) place which has the largest dome. I did the Islamic arches on the inner side of each pathway, which located after the glass. For the entrances, I did three entrances to the mosque, the first one which is the biggest one and two from the main (mosque) place. No entrances from the fourth side (north façade) due to AL-Qiblah. For the main (mosque) place, at the beginning I made the height of it about 10 meters, but when I did the openings (Names of God) I realized that my concept would not work in this case due to the direction of the shadow. So, since I did not want the shadow to shows or goes to the floor, I came up with the mirror idea. In this case I had to extend the ceiling about 10 meters more, so, the first 10 meter for people and the rest for the effect of the shadows. To do this I had to do a slap under each opening (name) (5 by 7 meters) and its materials are concrete from the bottom (where people can see it) and mirror from the top (which is not visible for them). How this works? Basically, when the sun hits the window and create the shadow, the shadow will goes to the mirror and the mirror will reflect the letters on the ceiling. Since some of the shadow would not appear due to the void of the biggest dome, I also had to make the width larger to let all of the letters appear on the ceiling. Regarding the colors, since mosques are very unique and I wanted to take people's attention to the mosque, I chose the white concrete color for the walls, and gold color for the domes and some part of the minarets. I think these two colors are really valuable and make any building very especial from a far distance. For this project, I used five tools (programs) to make it completely done. 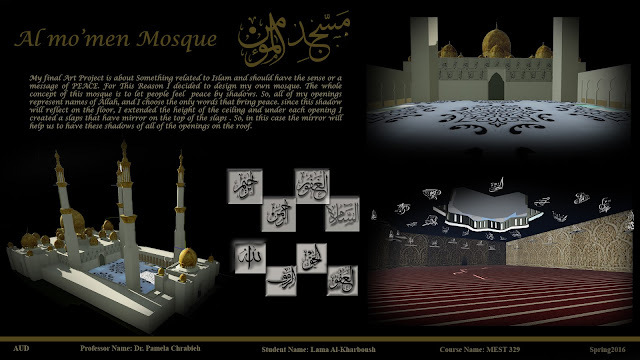 First of all, I used AutoCad to draw the outlines and the whole floor plan of the mosque. Then I exported to Revit to make the 3D Shape of the mosque, which include walls, columns, minarets, doors, window, and arches. Furthermore, it was so difficult to make the domes in Revit, so I made the dome by using 3Dmax then exported to Revit. After that, I used Lumion to apply materials for walls, doors, roof, and floors, and to render the mosque from outside and inside. Finally, I used Photoshop to edit my renders, to make the shadows, and to make my poster.